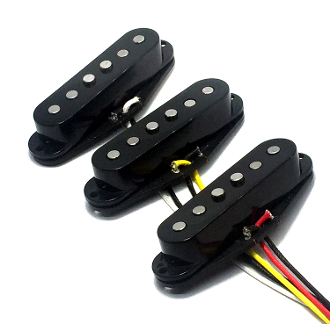 Dragonfire Area 52 Single Coil Strat pickups feature the multifaceted benefits of Alnico 5 magnet performance for your Bass Strings and Alnico 2 performance for your Treble Strings. The Alnico 5 magnets in these pickups provide warm tone for expansively creamy sound so your playing can take center stage. The Alnico 2 magnets can give you a subtler bite than the A5s while improving mid-range presentation with a softer magnetic string pull for great results without going overboard. Working together, the A5s boost bass performance and sound while the A2s lighten your treble and bring breath to your playing. For this pickup, the A2 and A5 rod magnets pair harmoniously to offer sweet snap, clear and crisp response as well as the articulation you deserve. Rounded and dynamic, these pickups highlight the finest qualities of both magnet styles as well as the coherence needed to really shine. Presented together in these Area 52 pickups, the A2 and A5 magnet styles converge beautifully to enhance almost every playing style and genre with both high and low strength and quality. These are dedicated position pickups for performance enhancement and differentiation. Each pickup is wound specifically for a position and the Middle position pickup is Reverse-Wound and Reverse-Polarity (RWRP) to ensure the best possible set execution and collaboration. RWRP gives you hum-cancelling in Positions 2 & 4. These pickups are not position interchangeable. Beveled vintage style slug polepieces with a gentle edge slope add visual depth and subtle detail. Staggered poles allow for maximum string response and set-up options. These are 2-wire pickups that come with a hot (colored) and a ground (black) wire for easy installation. We offer your choice of a single bridge, middle or neck pickup or a matched SSS set. We recommend using 250K pots and either 0.022 or 0.047 tone caps (available separately) with these pickups. Allow and expect variation in color due to photo and monitor settings, perception, lighting, as well as natural product variance. Color descriptions indicate color of item, not material. Ask any questions regarding options, measurements, installation requirements, special requests, etc. prior to purchase. Due to the vast and varied nature of possible set-ups, we do not provide specific information, instructions or diagrams for installation. You should be able to use basic knowledge of wiring with the diagram or instructions of your choice. Installation requires soldering and compatible system. We provide enough pickup lead wire to complete installation wiring in standard usage situations. Take your time for installation; do not use power tools and do not over-tighten or apply too much pressure on components.